**This app is not yet compatible with iOS 8- an updated version will be out soon! An exciting new story from "Super U" 5 stars App series! Come save the life of the dinosaurs in the best personalized story ever told! This unique, fun and exciting adventure story will engage and entertain your child with rich animation and interactive playful screens. 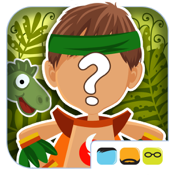 Your child is the hero in this interactive story whose goal is to collect super powers, make the world a better place and save the life of the dinosaurs! Insert the name and photo of your child and yourself and transform this children e-book to a family adventure with a personalized story theme and tailored screens. Enjoy more great personalized games for children, available to download from the "Super U Shop" within the app: Coloring pages from the adventure! Folding pages! Connect the dots game and many more!!! Bonus: Free personalized games waiting for you within the app! Download the app and enjoy! • This interactive e-book is designed to contribute to children’s self-esteem and confidence. This interactive story app strengthens child’s perception of family and teaches about the importance of environmental care, helping others and protecting animals. 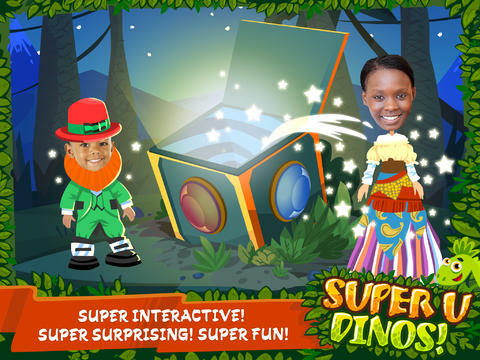 • The SuperU application features beautiful animation that is ground breaking in the field of interactive stories for children. The children animation, engaging sound effects and soothing narrator will fascinate and educate your child.